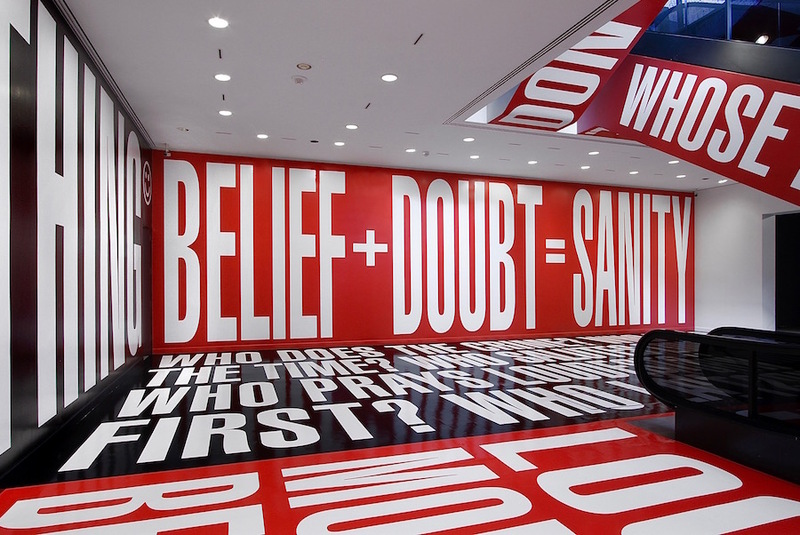 Some of today’s most arresting art is by American conceptual artist Barbara Kruger. Two distictive characteristics define her style: provocative statements and a bold red, white and black palette. Both are hard at work in her current installation “Belief + Doubt” (shown above) at Washington, DC’s Hirshhorn Museum. People have compared her work to that of Russian Constructivism, Dadaism and even Neo-Dadaism. You could build an argument that all have influenced her art, however, I believe Kruger is referencing something far less intellectual. I see the visual language of newspaper headlines, advertising snipes and warning signage doing the heavy lifting here. In each of these examples the colours red, white and black are instrumental in drawing focus. The blacks and whites speak confidently, while red and its association with passion, energy and danger injects a sense of urgency to the messages. Those who design notices for the public know that the addition of the colour red will not only command a viewer's attention, but also help instigate a reaction. Kruger started out as a graphic designer in the magazine world, where she learned the importance of quickly capturing a reader's attention. During these years she honed her ability to craft straightforward, easy-to-digest layouts. “I try to deal with the complexities of power and social life,” Kruger says about her current work, “but as far as the visual presentation goes I purposely avoid a high degree of difficulty.” She calls this tactic “direct address.” And it’s that directness that catches the viewer off guard, wakes them up and forces them to pay attention.